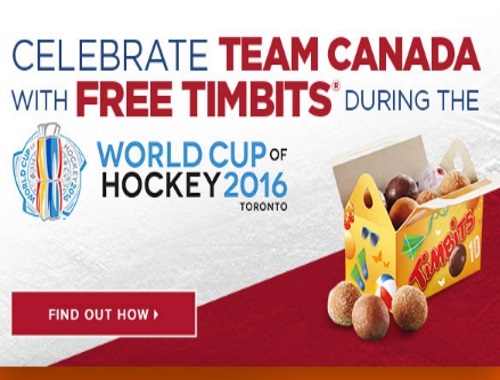 Score a Free box of Tim Hortons Timbits during the World Cup of Hockey in September! To take part in this offer, just purchase any Tim Hortons at-home product (excluding Bottled Iced Capp) between August 22- October 1. On a Team Canada game day, bring your receipt into any participating Tim Hortons and get your 10 Free Timbits! Each receipt is valid for one redemption. Walk-in only. Offer valid September 9-October 1, 2016. Redemption available only on Team Canada game days (including Semi-Final and Finals games).